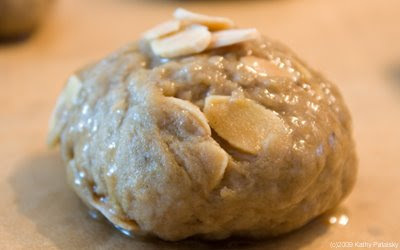 Recipe: Almond Butter "Nut-Tea" Cookies. 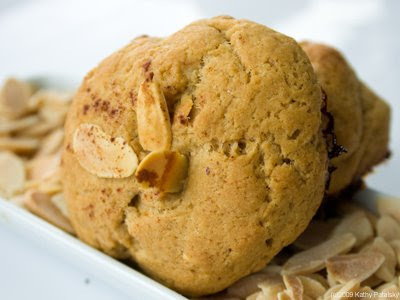 Bite into an Almond Butter "Nut-Tea" Cookie and experience vanilla-almond bliss. 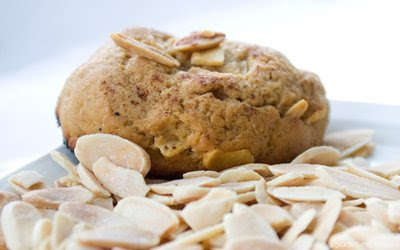 Half scone-half cookie, they bake up thick and fluffy on the inside, with a crunch of roasted almonds in each warm bite. TEA-rrific! 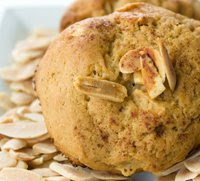 Yes, these cookies go great with a cup of hot tea or chai, but that's not the only reason they are called "Nut-Tea" cookies. I've added a new level of flavor depth to the classic nut-butter cookie by adding a cup of fragrant antioxidant-rich tea to the recipe! The tea flavor is mellow, yet savory. Almond Butter Switcheroo. Peanuts are great, but I prefer vitamin E and fiber-rich almonds. 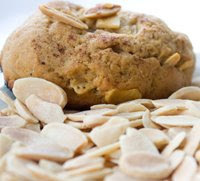 Almonds are incredibly healthy and add just enough crunch keep you mouth happy. First mix dry ingredients (exclude almonds) and add in liquids. Mix well, until soft dough forms. Add almonds. 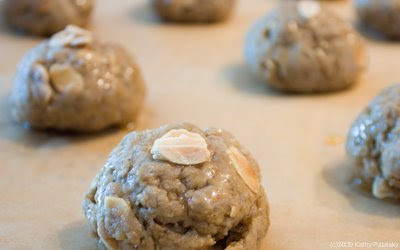 This should thicken the dough enough so that you can roll portions into balls with your hands. If the dough is too watery, add more flour and a tad more sugar. Line up hand-rolled balls. About 1 tbsp of dough for each. Glaze: Apply a thin layer of the Sweet-lemon Glaze to the top of each cookie. 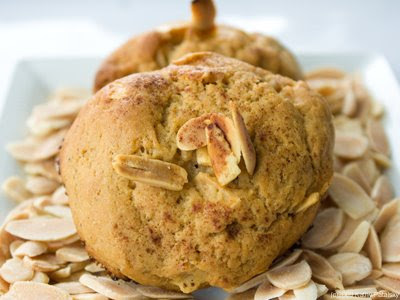 For a sweeter cookie, sprinkle a pinch of cinnamon-sugar on each cookie top. 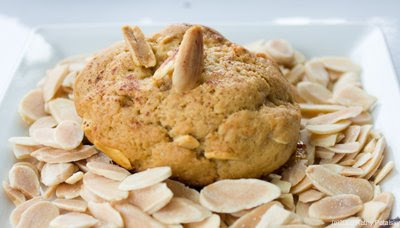 Press about 3-4 sliced almonds into the top of each cookie. Bake at 350 degrees for twenty-five minutes or until a light crust forms on the cookies. Do not over-cook. Cookies will harden slightly once they cool.